Quilting for the first time! I'm trying to make a quilted cover for my "Special Memories Scrapbook". The post bound album that I bought has a boring solid blue cover which I find totally uninspiring. 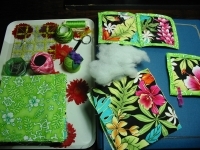 Since I want everything about this scrapbook to be special, I'm using some of my favorite Hawaiian fabrics to give it a new look with a hand made quilted cover. Cutting fabric and sewing are not my thing! I have an atavic repulsion towards sewing machines (it must date back to when I was still a little comma in my mother's womb and had the first battle with one of those wicked things), so hand sewing is my only option and it's a bit too slow for my liking. I also don't have the patience to measure and pin fabric carefully (as you can see from the pic), but I love my colorful fabrics, so small projects are going to be ok.
WOW! Amazing! Hope this new hobby is enjoyable for you. I made a quilt too, many moons ago. But I went big...And it made me very proud when I finally finished it! But that was the one and only I have ever made. Thank you Antonet! I'm enjoying it so far, but I'm going to limit this to small projects. 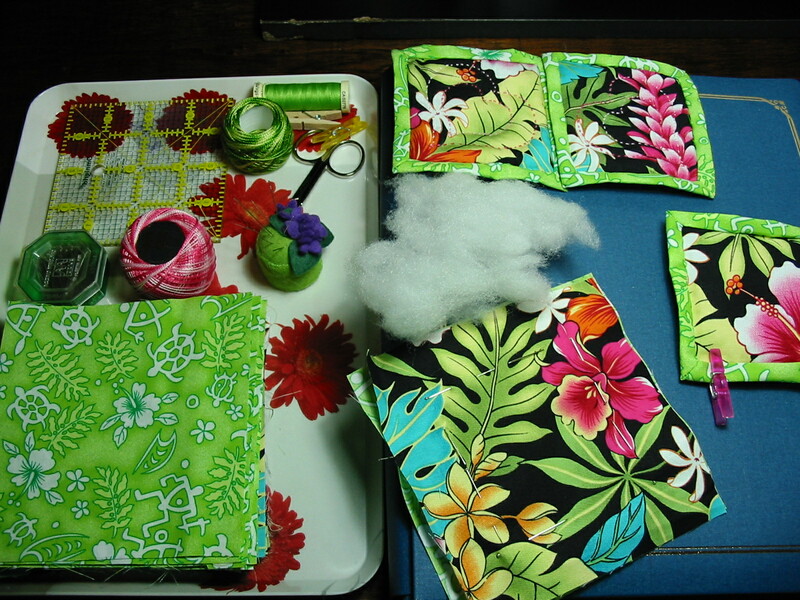 Maybe a couple of mini panels as a base for bead embroidery and little pouches and eyeglass cases.